Four men have taken the lives of American presidents. 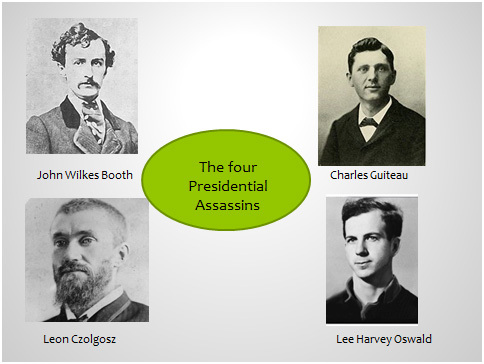 Their murderous acts have changed the course of American politics. Who were these murderers? Why did they do it? What did they hope to gain? What brought them to commit these crimes? This is their stories and what brought them to these tragic conclusions. Hugh Boyle is a founding member and president of the Delaware Valley Civil War Round Table and the April 1865 Society. He serves on the faculty of the Civil War Institute at Manor College in Jenkintown, PA, where he teaches courses on Abraham Lincoln’s life and assassination as well as other Civil War topics. He also serves as Executive Director of the GAR Library and Museum. He is on the board of directors of the annual Bensalem Reenactment. He is a member of the Surratt Society and the General Meade Society and the Abraham Lincoln Association. He is a member of the Lincoln Forum and a book reviewer for Lincoln Herald magazine. He is the former publisher and book review editor of the “Civil war Brigadier” newspaper. He has given lectures to Civil War Round Tables, Museums, Historical Societies and civic groups. He has spoken at seminars and symposiums on Abraham Lincoln, his life his presidency and death. He is now retired from his position as National Sales Manager of Roadpro 12 volt electronics and lives with his wife Rose in Bensalem, PA. This entry was posted in Meeting archive on November 1, 2014 by hlj.